Summer Yellow! I'm not a big fan of yellow but I thought I'd give it a try. Supposed to feel summery.. but with the erratic cool and rainy weather and all.. I tried to compromise! What do you guys think? Pwede??? hehe! Yes I wore this to the SM Accessories event! Hey Coffeeholics! I know its been a while. Yeah I've been busy with work. The month of March is a very busy month for us teachers what with the end of the school year looming ahead.. the grades that need to be completed and computed.. the numerous activities that are yet to be planned and executed (outreach class project!).. plus of course my pet writing projects which includes this blog! Yep March has already been eventful for me and its not even half over! I've got so many plans and I'd just like to share three of them right now! 1. BIG THREE OHHH! Giveaway. I just celebrated my birthday last week and I turned 30 (wahaha.. inaamin ko na!) so I really wanted to celebrate it by having a GRAND birthday giveaway which I plan to launch by the end of March. I already have some stuff set aside for this giveaway but it wouldn't hurt to give out MORE right? Hehe. So yeah.. those who would like to help me out here by sponsoring my blog giveaway.. YOU ARE VERY MUCH WELCOME! 2. LAPTOP. Ok so since I just turned 30, I wanted to buy myself a gift. I was thinking of getting a new laptop AND/OR a new cellphone. I'm leaning more on the laptop (budget wise and mas practical!) but I'm still confused on what brand or laptop model that I should get. The laptop will mainly be used for my online work and surfing. Definitely I don't need one specifically for gaming.. just enough "entertainment" factor so I can play FB games and watch live streaming. haha. I've been checking out models and saw a Samsung laptop but I still haven't decided.. so techie blogger writer people.. HELP! Advise advise? haha! 3.TRAVEL. SUMMER is almost here!!! And yes one of the things I'm REALLY looking forward to do in summer is to travel. I would love to travel either locally (Koron/Palawan/basta beach!) or go abroad (HK/SG wish wish pa lang ha!). Of course when I saw the latest FB application promo by SM Accessories, the urge to go away for summer really really kicked in! Check out their wonderful promo and you just might be one of the lucky FIVE FB winners of 2 round trip tickets to anywhere in the Philippines! Also Ray-Ban and D&G shades will be given to 10 other runner ups. Its so easy to join! Do visit SM Accessories Facebook Page to access their Facebook Application promo. 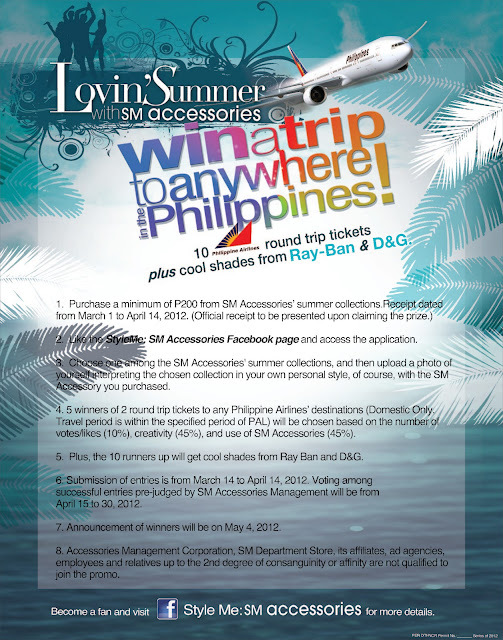 So coffeeholics, get a chance to win FREE tickets to an awesome summer vacation thanks to SM Accessories! Promo ends on April 14, 2012. Happy shopping, posing, and voting guys!